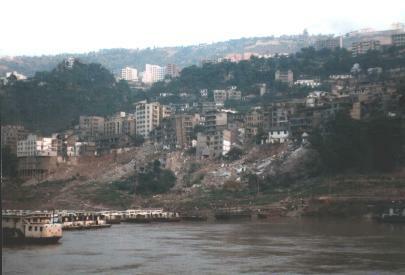 CHONGQING, SEPTEMBER 1999 - One of my goals when coming to China was to see the world famous 'Three Gorges' on the Yangtze river. The way to see them is by taking a 'cruise' onto the Yangtze river. I went for a three day trip from Chongqing to Yichang. Most of the trip was done using a big 'cruise' ship. Don't imagine this ship as being a luxury ship however. To the Chinese these boats are often the only way to get away fom their village. The ship has some 'luxury' cabins for tourist (which are clean cabins but not at all luxury ones...) and the rest of the ship is standard cabins that are used by Chinese people, with communal showers and bathrooms. From the moment you arrive on the docks, porters try to convince you to carry their luggage. It's hard to convince them you have already hired a porter. Taking your backpack yourself onto the ship would be a big offense to these men. The porters also carry the rest of the 'load' of the ship - like the laundry (sheets etc...), the food and other goods that need to be transported. Everything is loaded manually. It's interesting to be on the ship and watch the loading process - it takes many hours. During the three days, the ship stops several times to allow the tourist to visit some little village, sometimes there is a temple - for the Chinese this is just their endpoint or the place they have to load or unload their goods. Most of the little villages will disappear because the water level will rise 135 metres when the Yangtze dam will be completed. Millions of people are to be relocated because of this dam project. Along the sides you can already see white housing blocks that will become the new homes of these people. Their current houses will be 'dismantled' stone by stone. Nothing is wasted here. What struck me however was the amount of waste on the river. In fact the whole river is a floating garbage dump. Everyone throws their garbage from the ship into the river ! 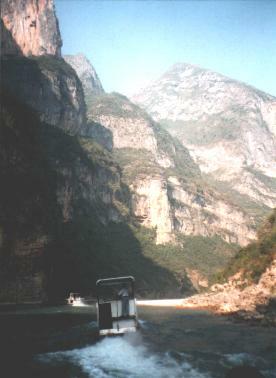 A main attraction is the visit to the 'Lesser Three Gorges'. These are very narrow gorges with only shallow water levels. It takes small boats to visit them. I also went on a tour with one of these small boats. The sights are really spectacular. It happened a few times that the little boat got stuck - the boatmen used bambo sticks to keep the boat floating. Suddenly the boat stopped near to the side. Everyone had to get off. It appeared that our boat had an engine problem. When we were all on the shore of the river the boat left and went for spare parts... We were left alone in the middle of nowhere. Half an hour later the boat arrived again and we could go on. 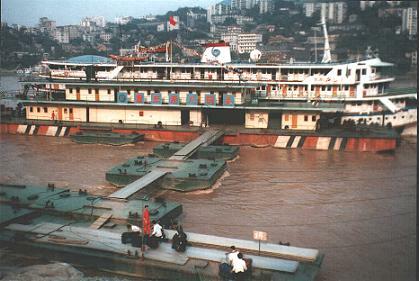 After this exciting trip, we boarded the big ship again and were ready to continue on the Yangtze. That was however not possible : the ship had an engine problem and could not leave ! After 8 hours, a couple of beers and a lot of fun in the karaoke bar, the ship finally left the dock again. It was already late in the evening. In the middle of the night I woke up by the sound of a bell. I walked out of the cabin and saw that we were in a giant lock. It was the temporary lock of one kilometre long that is built due to the dam project. The Yangtze is blocked here by a temporary dam and the ships have to use this lock to go further. A few hours later we could go ashore and our wonderful cruise was over. But we had one more big event coming up: the excursion to the dam project. This is really the most giant project I have ever seen. A complete city is built where the construction workers live, housing 50.000 people in total. The building site itself is unbelievable. Giant trucks are dwarfed by the walls of the dam and locks that are being built. The rock dust in the whole area blurs your view. My black boots were white covered with dust when I left the construction site. As a tourist you have only limited access to this site. There are obviously a lot of guards and they do not like you taking pictures of everything. Currently, phase one of the dam project is terminated. 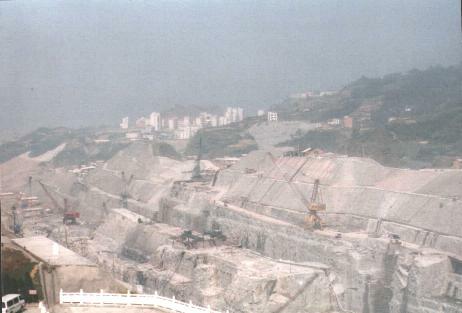 The dam project is scheduled to be complete in 2007, the 'Three Gorges' will be history then.